Dragon Ball FighterZ, the video game, is incredibly faithful to its source material which is, duh, the long-running anime series Dragon Ball Z. And the game’s fans and commentators are tying the game to the show in ways that create something wholly their own. The television show ran from 1989 to 1996, and a sequel series called Super ran from 2015 until earlier this week. (For our purposes here, we won’t even get in to the original Dragon Ball, its kicked-from-the-canon step-brother Dragon Ball GT, or the many movies.) A lot of the people who followed the years of scripted big- and small-screen fights between iconic characters also hail from the fighting game community, which over time has built up its own lexicon for its competitive scene. Commentators like Michael “IFC Yipes” Mendoza and “Tasty” Steve Scott, known from for their work in games like Marvel Vs. Capcom (a three-on-three fighter like DBFZ) are some of the primary drivers of the fun here. The Versus series—where phrases like “curleh mustache” and “when’s Mahvel?” took on lives of their own—has its own history of commentary becoming part of the average player’s diction, and that’s carried over to FighterZ. The typical style is pretty similar to straightforward MMA or boxing analysis, with a few scoops of pro wrestling added in. When Hit lands his level 3 super, Scott exclaims “take ‘em to church!”, referencing the stained-glass appearance of Hit’s time freeze. When Kid Buu uses his crouching medium attack to stomp the ground, creating quakes along the surface, he’s stomping the yard. Fighting game commentators, in other words, are more entertaining and energetic than their counterparts in most other genres, with a few exceptions. In FighterZ, that’s the case, but the commentators also have a beloved anime series to integrate. Take the canonical match-up. When two characters who famously brawled in the Dragon Ball series are in play in a FighterZ match, the commentators will call it out and riff on it. At Final Round 2018 last weekend, commentators Scott and Kitana Prime called out it when Chris G. brought in Trunks to fight Momochi’s Goku Black. 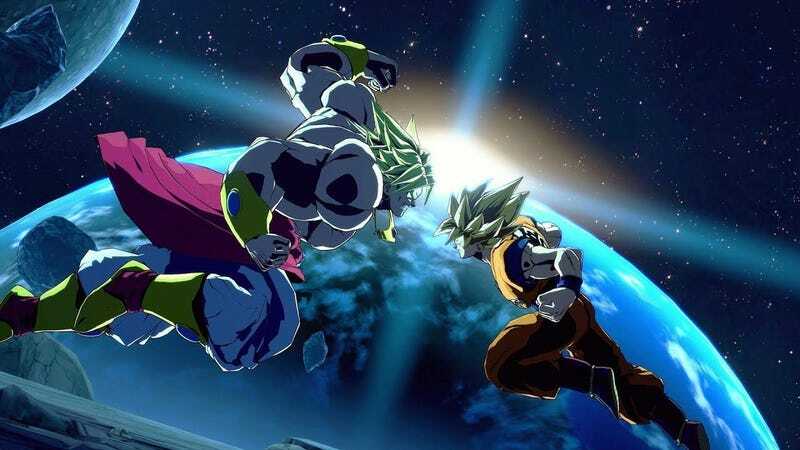 “Trunks really lookin’ to change the future in this canon match-up right now,” said Kitana Prime, referencing the fight between the two in Dragon Ball Super. Even at the outset of the same match, the two commentators note the exchanges between the characters. Scott makes a joke about Trunks not being like Gohan’s dad, Goku, and instead powering up to full at the outset of the fight. The source material comes into play mechanically in moments like summoning Shenron, the wish-granting dragon, in the middle of a match. For a very high cost, players can collect the titular dragon balls and summon the dragon, giving them massive power or the ability to bring an ally back from the dead. It even extends outside of competition into more casual players. 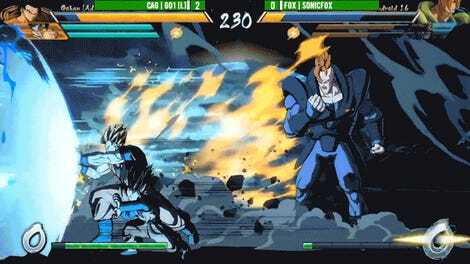 One streamer, Lee “Lythero” Geary, has devoted himself to the annihilation of Goku in honor of his chosen character Android 16, who was designed to destroy Goku in the series. Tied into that is the Dragon Ball Z Abridged version of 16, a parody who is incredibly determined to kill Goku. The streamer has even joked about adding upcoming DLC character, Bardock, to the list of valid Gokus—since he’s Goku’s father, he also must die. My favorite was at Final Round, when the grand finals between SonicFox and Goichi came down to the last game. Earlier in the weekend, Goichi had dealt SonicFox a crushing 10-4 loss in a pre-tournament exhibition. Thanks to some good luck with the bracket, their very next match was in the grand finals. With the series tied 2-2, SonicFox was one game away from winning the tournament and making up for his earlier embarrassing loss. The two laughed, and as they steeled themselves for the final round at Final Round, spectators started to put their hands in the air. In the Dragon Ball Z series, citizens of the Earth offered energy to Goku to form a Spirit Bomb made up of their collective will and hope by putting their hands in the air; at Final Round, attendees were giving their energy to SonicFox. 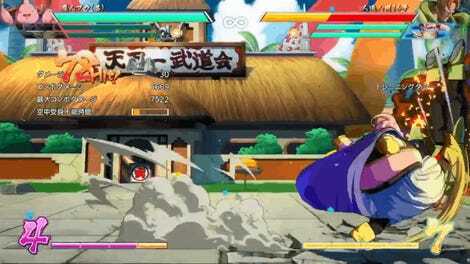 The Dragon Ball FighterZ scene isn’t just wholesale aping its vocabulary from the shows, but it isn’t just another fighting game either. A beloved series, creative commentators, and fighting game culture are mixing something both familiar and new, and making a unique cultural mosaic in the process.